A workshop organised by the World Bank and the Ministry of Finance will be looking at the use of Mobile Money and phone cards as forms of money laundering in Guyana over the next few days. 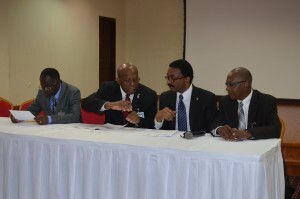 The risk assessment workshop which includes several stakeholders will be looking at ways to combat challenges in the money laundering sphere that are unique to Guyana’s economy. One of the considerations being made is the fact that Guyana is operates on a cash base economy so the opportunities for money laundering are greater and can be conducted via GTT’s Mobile Money, the sale of telephone cards and via money changers on the streets. Attorney General Basil Williams giving remarks at the work shop noted that while legislative framework is in place, there must still be steps to ensure that such legalities are up to date. “The importance of a strong regulatory framework cannot be understated. The need to recognize this threat has been stated all over the world,” he said noting that as a result of this Guyana is “continuously pursuing ways to strengthen our legislative regime. He pointed out that the law must be aware and informed on existing and potential risks to Guyana’s economic framework. Meanwhile, Finance Secretary, Dr Hector Butts noted that the workshop will be instrumental on informing of all the manners in which money can be laundered. Dr Butts stated that it is imperative that Guyana does not provide an environment in which such financiers can enjoy the profits of illegal financial activities with little to no fear of being caught and reprimanded. The Finance Secretary said that Guyana has to ensure that the necessary measures to ensure corresponding banking relations are on safe footing.